President Donald Trump and Senate Minority Leader Chuck Schumer waged a war of words Friday afternoon over the fate of last-minute funding legislation that could head off a partial government shutdown. Trump insisted Friday that Democrats will ‘own’ the result, despite saying 10 days earlier that he wouldn’t blame them for the government closure that he’d be ‘proud’ to oversee. Schumer said on the Senate floor that it’s the president who ‘has us careening towards a Trump shutdown over Christmas,’ as he told Trump that he would not meet his border security demands. ‘President Trump, you will not get your wall. Abandon your shutdown strategy. 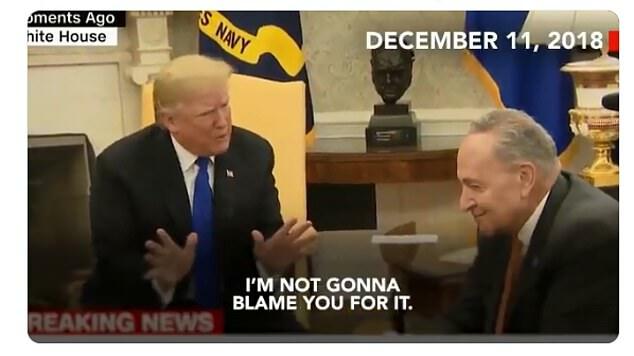 You’re not getting the wall today, next week or on January 3,’ Schumer said. 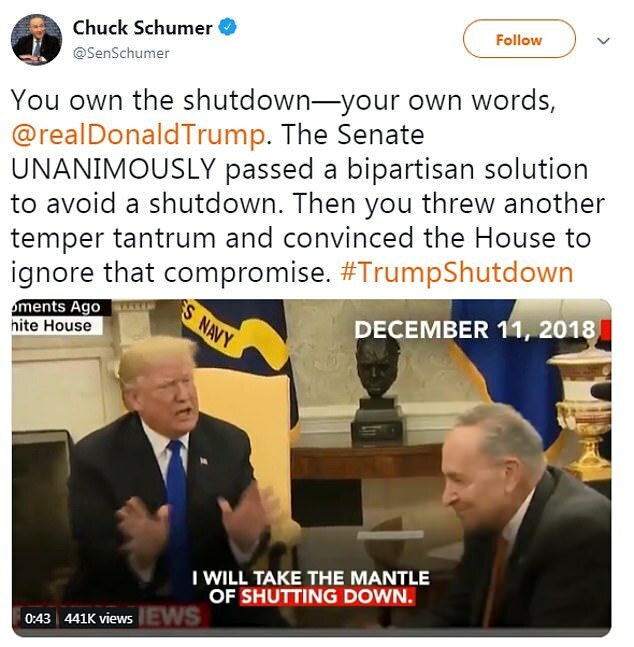 ‘You own the shutdown—your own words,’ he tweeted. But Trump refused to back down, admitting at the White House that the ‘chances are probably very good’ that a shutdown could take place. Trump had already said he expected a shutdown over the holidays if he didn’t get his border wall funding. 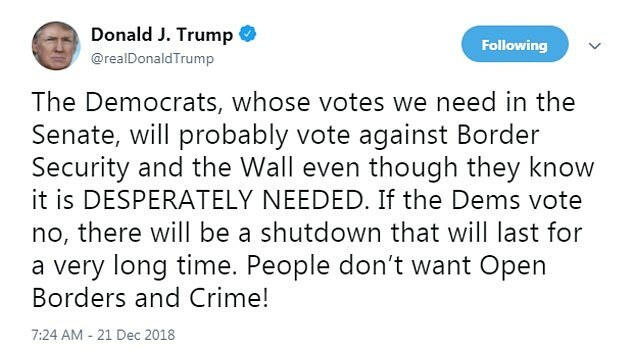 ‘Shutdown today if Democrats do not vote for Border Security!’ he said in a tweet. 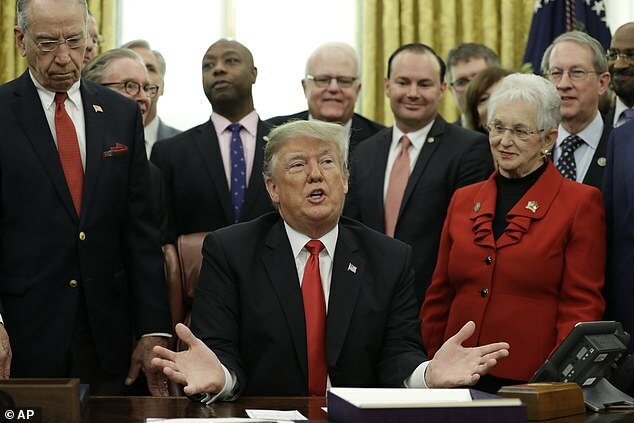 A House bill that would keep the government open passed Thursday evening that includes $5 billion to fund construction of Trump’s long-promised wall on the U.S.-Mexico border. That measure is dead-on-arrival in the Senate unless Majority Leader Mitch McConnell changes the rules to allow for a simple majority to pass it. McConnell has refused to change the Senate rules for two years and said Friday that in any other political environment Democrats would be willing to fund a border wall. If the Senate votes down the House bill that has the border wall funding, the president said on Friday morning that he would let the government shutdown rather than sign a Senate-passed measure that does not fund his wall but keeps the government open until Feb. 8. His spokeswoman said Thursday evening that he wouldn’t depart today for Palm Beach, as previously planned, for his Christmas holiday in the event of a shutdown. A departure to Florida was not on the president’s schedule on Friday, and the Federal Aviation Administration canceled flight restrictions over the president’s private club for the entirety of his holiday. Other than his nixing his own holiday, it wasn’t clear what the president planned to do if there was a shutdown or how long he would let one continue. ‘At this point we’re taking it day by day,’ strategic communications adviser Mercedes Schlapp said Friday morning on Fox Business. ‘This is a moment in time to get this done. For too long we’ve been waiting for additional funds for border security,’ she added. The president declined to say how long he’d let a shutdown go on when prodded by reporters after his bill signing on Friday. ‘I’ll be honest. This is such an incredible moment, what we’ve just done, criminal justice reform, that I just don’t think it’s appropriate to be talking about [other topics],’ he stated. The border wall is Trump’s best-known campaign promise. He’s said since the day he jumped into the 2016 race that he would build a wall fight illegal immigration. White House Press Secretary Sarah Sanders was optimistic on Friday morning about the passage of Trump’s border security measure as she spoke to reporters after a Fox News appearance. ‘Well let’s hope they don’t,’ she said of the likelihood that there will be a no vote. ‘I mean the senate and particularly Senate Democrats have a constitutional duty to protect the people of this country, and we hope they step up and fulfill it today,’ she said. It was the White House’s hope, she indicated, that disaster relief funds that had been added would convince reticent Democrats in the Senate to stomach the funds Trump wants for his border wall. She said Senate Democrats will be responsible for a shutdown, because they are refusing to go along with the House bill that ‘fulfills all of the things that they actually have said and they’ve campaigned for,’ including border security. Senate Republicans who share Trump’s beliefs were begging him not to shut down the government on Friday morning. The House vote was a symbolic victory for the president and his last chance to get the money he needs before Democrats take control of the House next year. But the victory is bittersweet. While it passed the House, both sides have acknowledged it’s dead-on-arrival in the Senate ahead of Friday’s deadline to avert a partial government shutdown. And the lack of next steps has increased the odds that deadline won’t be met. ‘Everyone knows it can’t pass the Senate. 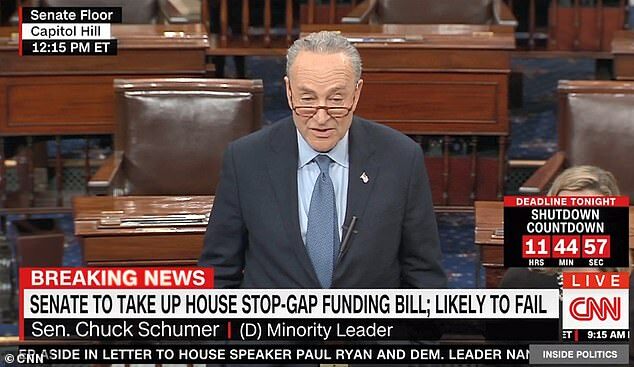 It’s a cynical attempt, a cynical attempt to just hurt innocent people and do just what President Trump wants,’ Schumer said Thursday night of the House measure. Republicans control 51 seats in the upper chamber, and need nine Democrats to side with them, based on long-standing rules for Senate’s operations, to overcome a filibuster. 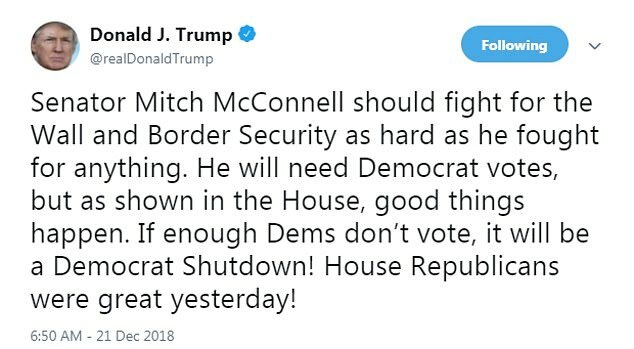 Trump told McConnell to throw them out and pass his border wall funding with a simple majority this morning as the nation stared down its second government shutdown since the start the year. ‘Mitch, use the Nuclear Option and get it done! Our Country is counting on you!’ the president said.